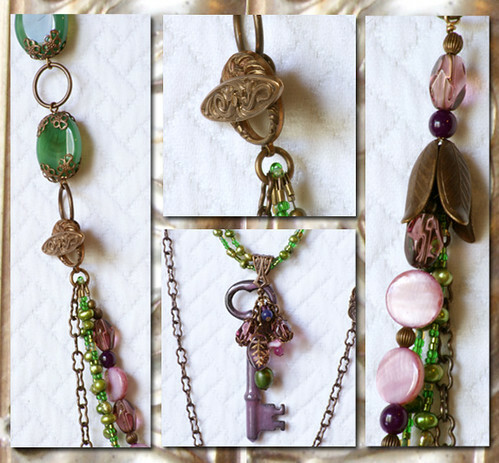 My new necklace design was inspired by this beautiful purple enameled key made by Laura Guenther for Blue Antiquities. Immediately, I began to think of the precious nature of a vintage key. What would inspire someone to wear it? The key to a secret place...a beautiful place...a secret garden... Monet. The purple beckoned the pinks and greens. Natural elements soon followed: pearls, botanical shapes, and a sweet little Vintaj brass bird (seen better here). In fact, the gorgeous tones of the hand-finished Vintaj brass components were an easy choice to complete the design and accentuate the key. I dressed the necklace up for a day at the office or special meeting by pairing it with a simple knit tee under a cream blazer. However, this could be worn around town with a drapey solid-colored knit tee and jeans, or with a simple, flowy summer dress to a garden party! 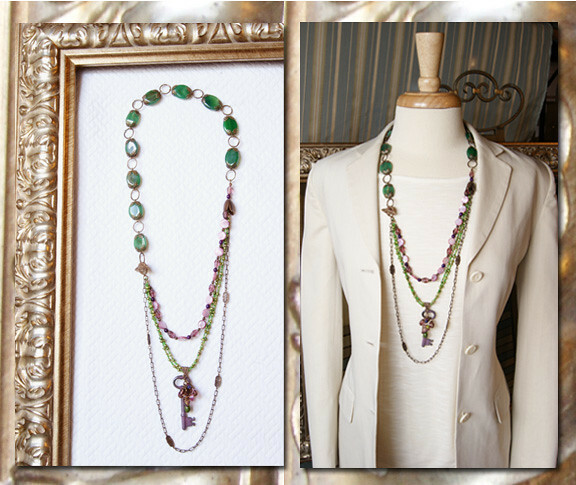 I love this necklace - the colors and strands go together beautifully!!! I love your model too! I love the multi-strand design. Monet is the perfect inspiration for these colors. Beautiful Erin! Thanks Heather and Patty! Your opinions mean a lot to me!